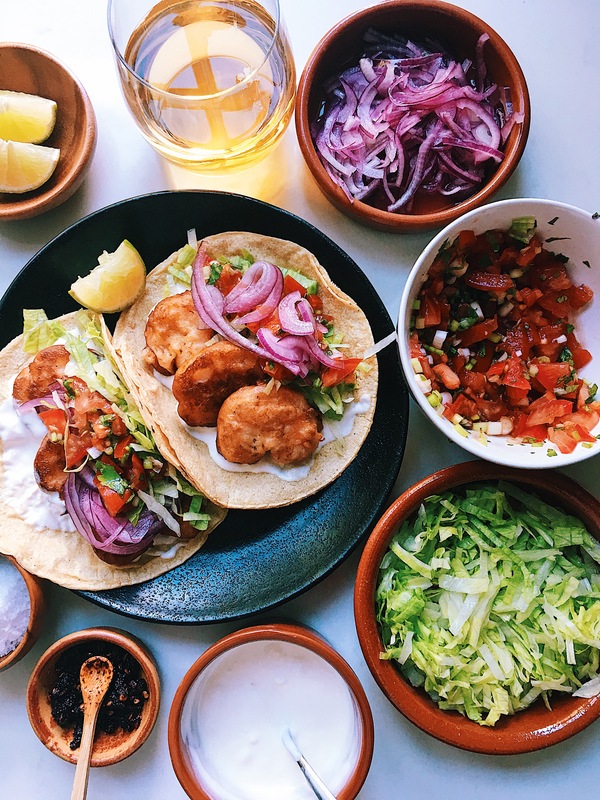 Today I am sharing with you the delicious recipe for Ensenada style or as many people know them “Baja Style” tacos, traditionally they are made with fish, but prawn are as popular as fish and the recipe is very easy, the secret is in the batter. This recipe is perfect for summer, so I hope you like it! To make the pickle onion. Wash the onion strings and add a tbsp of salt. Leave aside for 10 min, after, wash it thoroughly, to get rid off the excess of salt, then add the juice of one lime and a pinch of oregano and leave aside to pickle. Make the mayonnaise. 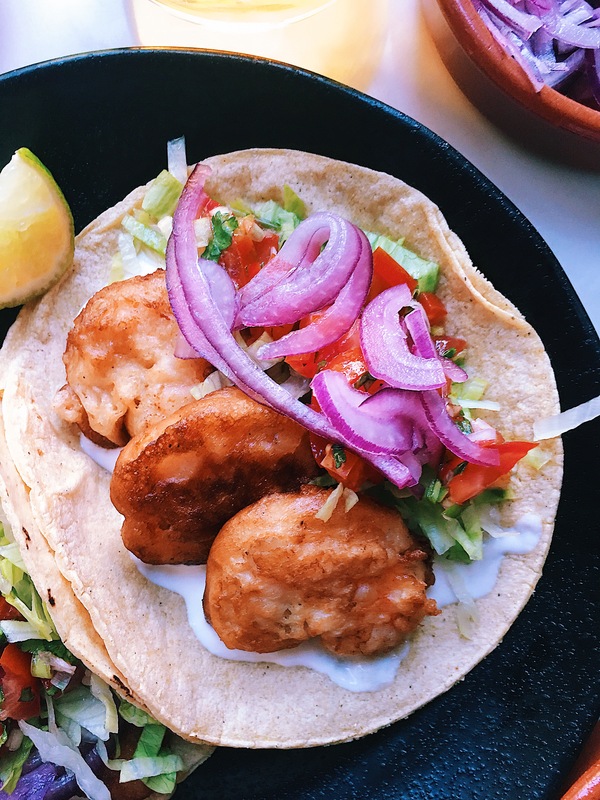 Mix the sour cream, mayonnaise, pinch of salt and pepper and a few drops of lime. Reserve. Shred the white iceberg lettuce finely and leave aside. To make the batter. Put all the ingredients in a blender: the flour, baking powder, egg, garlic salt or Maldon salt to taste, pinch of oregano, Dijon mustard, pinch of ground pepper and beer and blend for 2 min. Pass the prawns through some white flour, so the batter sticks better and then place them in the batter and leave aside, ready to fry. Heat the oil. Once the oil is very hot, place some pieces of prawns and fry them for 1 min on each side. Then drain the excess of oil by placing them on a paper kitchen towel. Heat the tortillas and cover them with a fabric kitchen towel to keep them warm. 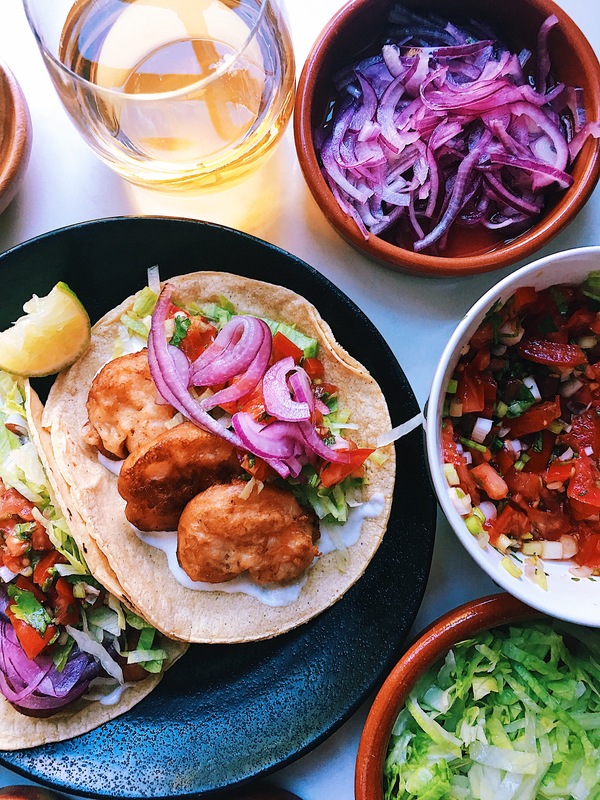 To serve the tacos, get a warm corn tortilla, spread some mayo and place two or three prawns and add some shredded lettuce, salsa bandera, pickled onion and if you want to add a bit more heat, add some spicy salsa of your preference. Enjoy them with some really cold beer.